Passwords are a pain. We all know that. We also know that they are an essential part of life. If you search "Do I really need a password" you might be surprised at the vast number of results on offer. It would appear that whilst we intuitively understand, possibly due to conditioning, that passwords are required, we're not totally sold on the idea. Why would we have doubts about a system that is intended to help keep and our data secure? Perhaps it has something to do with the manner in which we are forced into selecting ever more ridiculous combinations of letters, numbers and special characters that has led to general fatigue in this area. Here at Coracle the team are unwavering in their attitude and approach in helping to make sure that all of our customers, and their data, is as secure as possible when using the Learning Line. There is an ever present threat from a variety of sources that looks to exploit weaknesses in systems and the first line of defence is a robust password protocol. Coracle’s de facto standard is to allow a user freedom in creating a password. We don’t insist on strange combinations of random characters interspersed with upper and lower case alphanumerics. Forcing users into making passwords that appear harder to crack isn’t necessarily effective, especially as the user will find them harder to remember. ‘Dictionary attacks’. Consider the fact that the Oxford English Dictionary contains around 170,000 word and that the average person uses no more than 40,000. If a hackers' computer was sampling one word a second, the entire dictionary can be tested in just a couple of days. It is for this reason that most websites limit the number of attempts that a user can make when entering their password. ‘Brute force’. These attacks, also known as ‘exhaustive key search’ attacks work by checking all possible passwords until the correct one is found. This technique is very fast for short passwords, but very hard for long passwords. 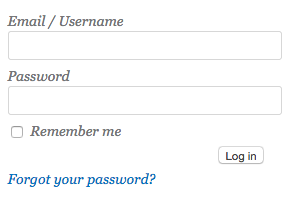 As the password length grows, so the number of options grows exponentially. Which type of password is strongest? You might conclude that something longer and something that includes a mix of characters is best. If you thought the second password was the stronger then go to the top of the class! The second password is the stronger because of something called password entropy: a measure of the uncertainly in the password, In other words, how hard is this combination of characters to crack? The truth is that increasing the number of characters increases entropy more than changing letters for symbols or numbers. If the concept of entropy is not familiar to you, think of it as the number of ways something can happen. For example, if there are 3 taxis and 4 people, how many ways can the people be placed in the 3 taxis assuming that 4 people will fit in 1 taxi and that order is not important? In the example of the two passwords above the other factor to note is that the words are unconnected: they are selected randomly, and as such they combine to form a stronger password. For some of our customers the need or desire to protect accounts is particularly important and we can offer a range of tools to help in this regard. Login IP Range. Limiting IP ranges means that access to the site can only be made by users from within a designated IP address range, for example a corporate network or VPN. Attempts to login whilst outside of the IP range will be refused. Two factor authentication. This approach means that all login attempts add an extra authentication factor added. For instance, username and password take the user to stage two where an extra authentication challenge must be met. If you want to discuss more about this topic then please get in touch with the team at Coracle.